The Low Down: Duncan has returned for his senior year at The Irving School. A school with many traditions, one is where the previous year’s seniors “pass” their rooms on to the new seniors. They are left a “treasure” as well, which can be anything from books to liquor to Yankees tickets. Much to his dismay, Duncan gets the room that no one wants – it’s small and has a tiny window. His bequest: a stack of CDs made by the room’s previous occupant, Tim Macbeth. Thinking they contain music, he starts to play the first one. It is Tim telling the story that Duncan doesn’t want to think about; the actual tragedy that took place at the end of the previous year. One that Duncan witnessed. Best Thang ‘Bout It: A well-crafted story, I liked the Shakespeare references, this boy who knew he would always be judged by his appearance, and the girl stuck in a relationship. The means of telling of the story was clever, one that allowed both Tim’s and Duncan’s tales to be told simultaneously. The story idea was fresh as well. I’m Cranky Because: As present as all the elements were, I never felt that the story jelled for me. It wasn’t from a lack of a foundation that it didn’t crystallize either; there were threads throughout that were subtle yet visible that led to the end and came together nicely. We get to know Tim very well, but not really anyone else with the same amount of depth. I did not feel connected with or moved by most of them. I also thought the climax of the story was rushed which made it rather anti-climactic. There was so much time spent trying to discover what happened, then it finally happened, then book was over. Should You? : When all is said and done, It is absolutely worth reading. 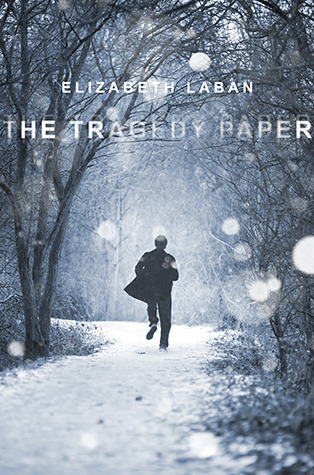 The Tragedy Paper by Elizabeth LaBan was published on January 8, 2013 by Alfred A. Knopf Books for Young Readers. You Might Want to Know: Minor references to underage drinking. This story seems really interesting, I love how you said there were Shakespeare references! 🙂 Great review! Thanks! Let me know what you think about it!